Product #16600 | SKU ECM77BMP | 0.0 (no ratings yet) Thanks for your rating! The Sony ECM-77 is a miniature omni-directional lavalier microphone designed for professional broadcast, sound reinforcement and recording applications. The condenser element features a miniature profile allowing it to be easily concealed in performance and broadcast situations. The omni-directional pattern provides even frequency and sensitivity response at the direct and off-axis sections of the microphone capsule. The ECM-77 provides a wide frequency response of 40Hz - 20kHz. The wide frequency response enables the microphone to accurately reproduce audio signal from a wide variety of sources. The ECM-77 is manufactured with a variety of connectors to accommodate various input devices, this version features a 3.5mm (1/8") mini connection for use with the WRT-805 and UTX-B1 beltpack transmitters. Phantom power is supplied via the connected body-pack transmitters. 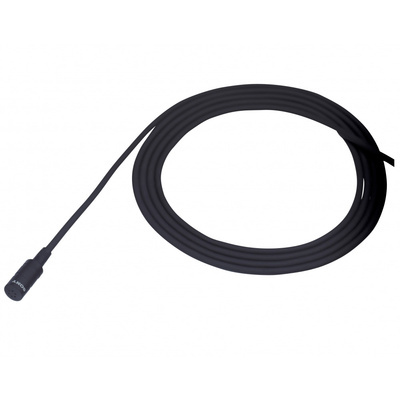 The ECM series is available in a variety of connections, this version features a 3.5mm (1/8") mini connection for use with the WRT-805 and UTX-B1 beltpack transmitters. Phantom power is supplied via the connected body-pack transmitters. Output Connectors 1/8" Mini-Plug with Locking Mechanism for Use with the WRT-805A Beltpack Transmitter.